It was startling to see my grandmother in a wheelchair, and more shocking to see her in what felt like a hospital. Just a couple weeks earlier, she was independently ambling down the halls of her senior apartment complex. But a minor medical condition landed her in the hospital for an overnight, where doctors assessed her dementia too severe for her to return home. A week later she moved to skilled nursing care. There, I realized the wheelchair was a convenience for staff, who shuttled elders in large groups to activities and meals. Though most could walk, the wheelchairs simplified things. Exactly like Robin, my 3 and a half year old. Our outings often start with the stroller debate. He can plainly walk, but his energy may give out, or he may simply refuse. I can’t carry him home. As our kids age out of strollers, my friends and I deliberate regularly. Robin is as tall as a kindergartener, so I endure judgmental stares as I push him. My mother feels the weight of judgment as she manages my grandmother’s care. It has gotten more challenging these last 3 years, as grandma’s memory has fallen away and bouts of disorientation have crept in. My mother’s daily presence has allowed her to live independently. Aside from errand running and outings, my mom drives over at a moment’s notice to fix a crisis: a misplaced hearing aid, mixed up meds or a TV remote control mess. These crises carry the same urgency that precedes my son’s melt-downs. She rushes in and works hard to sooth. Now, when my grandma fixates on wanting to return home and spirals down, my mother distracts her. It’s right out of the toddler parenting handbook. She is as exhausted as I am at the end of the day. “I can’t reason with her,” she says. “Tell me about it,” I answer. We are two weary caretakers. In the dining hall, my mom converses with another visitor. She too lingers with her mother over meals. “This really is a good place,” the woman tells my mother. It sounds like discussions I have with colleagues and friends about my son’s daycare. “It is a fantastic program,” I tell them. I believe it, but still feel the need to convince myself each time I say it. It isn’t guilt, per se. My mother bristles at the word. A good and faithful daughter, she has served my grandmother better than anyone and is rightfully at peace. Likewise, I know I am a good mother. But in each moment I am not with Robin, each time I imagine a stranger helping him on the toilet or settling him into a chair to eat, I cringe a little. I know the discomfort is similar for her. My mother visits the nursing home twice a day. I encourage her to step back and let Grandma settle in. Good-byes are the hardest. I remember those tender mornings when I returned to work. Robin cried when I dropped him at school. I calmly kissed him and walked out the door. In the parked car outside, I fell apart. But he settled into his own routines, friendships and the structured activities meant to stimulate him. Grandma has regular physical and occupational therapy. Though there is no circle time, there are regular sing-alongs in the activity hall, its walls lined with art projects that could have been executed by pre-schoolers—Easter forms embellished with crayon and marker, collages with colorful bits of tissue paper. 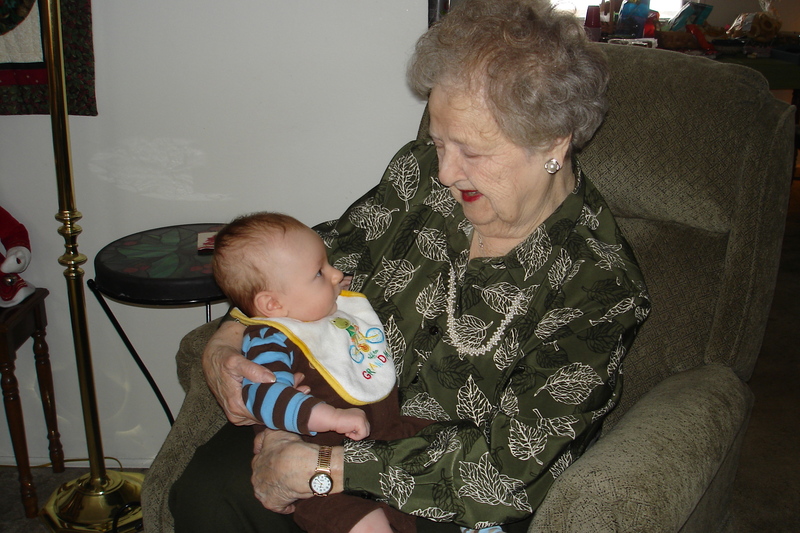 Robin has shared a special connection with his great Grandma Tillie since she held him as a baby. Something came alive in her. He stared into her face with a strange calm, a deep sort of recognition. In my grandmother’s delusions, she expresses panic about the baby she is supposed to be watching. It was clear after her breaks with reality in the hospital that Grandma needed fulltime care. I remind my mother she has done the right thing, just as I convinced myself a few years ago. I quickly realized I could not be a stay-at-home mom. It would be bad for me, for Robin, for our relationship. My mother too knows that she could not be a full-time caregiver. Aside from the staircases in her house, there is the more basic truth that living together would strain their relationship. In my grandmother’s lucid moments over the years, she has strongly agreed. My grandmother’s ability to reason comes and goes like a child’s. She is sharp and empathetic in certain moments. “Pat, you can’t be here every day. You need to have a life of your own too.” Then she panics when left alone. My mom feels she can’t leave her, just as I am feeling freer to leave my son. Robin and Grandma Tillie are passing in this moment, overlapping. Before long, Robin will be fully reasonable and my grandmother will slip into something more primitive. I don’t know what I will say to my mother then. This entry was posted in Family and tagged dementia, grandma, grandmother, grandparent, great grandma, mother, nursing care on May 22, 2013 by aszyper.